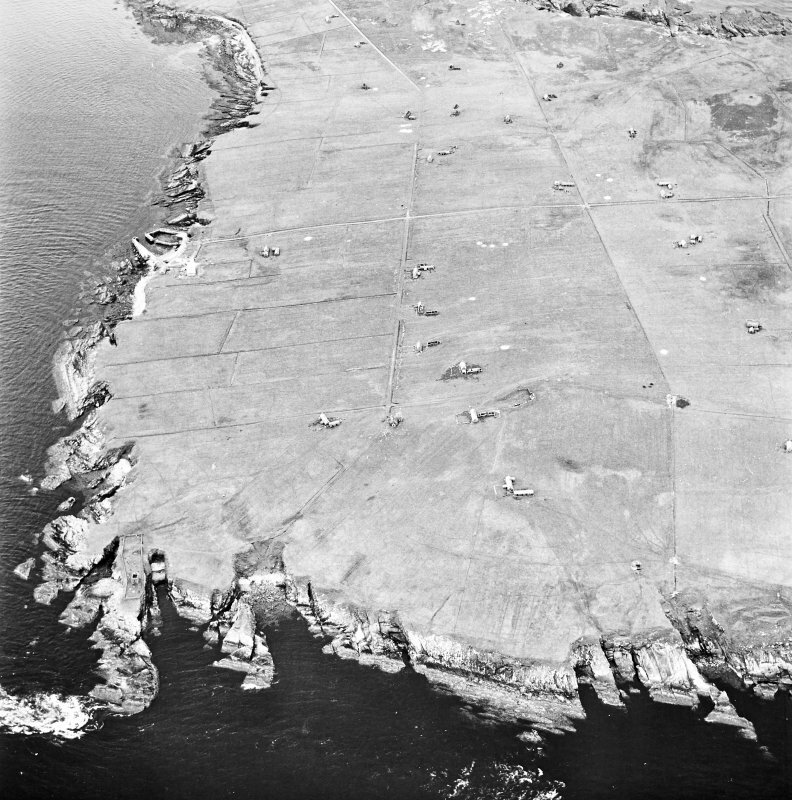 Stroma, oblique aerial view, taken from the E, centred on Uppertown township. A dovecot and burial ground, and the remains of Fendie Clett castle are visible in the bottom left-hand corner of the photograph. 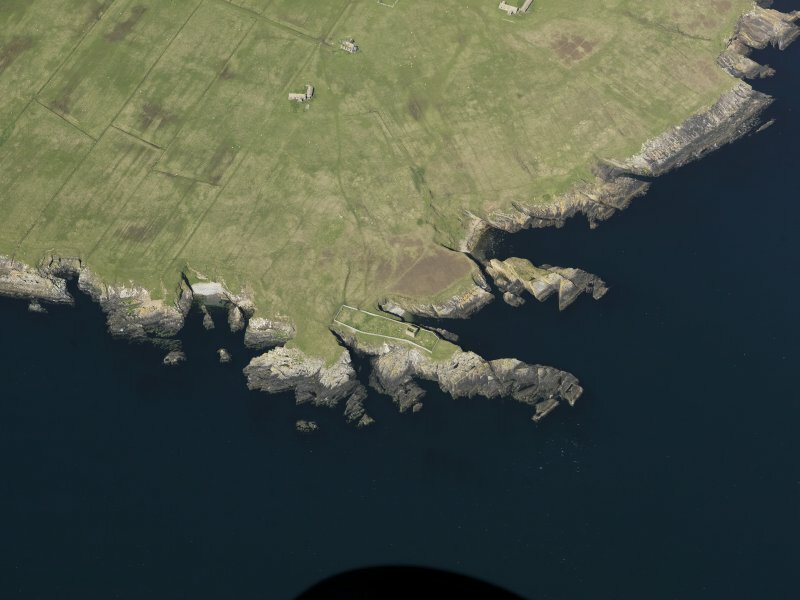 Stroma, oblique aerial view, taken from the E, centred on Uppertown township. A burial vault and dovecot are visible in the bottom left-hand corner of the photograph. 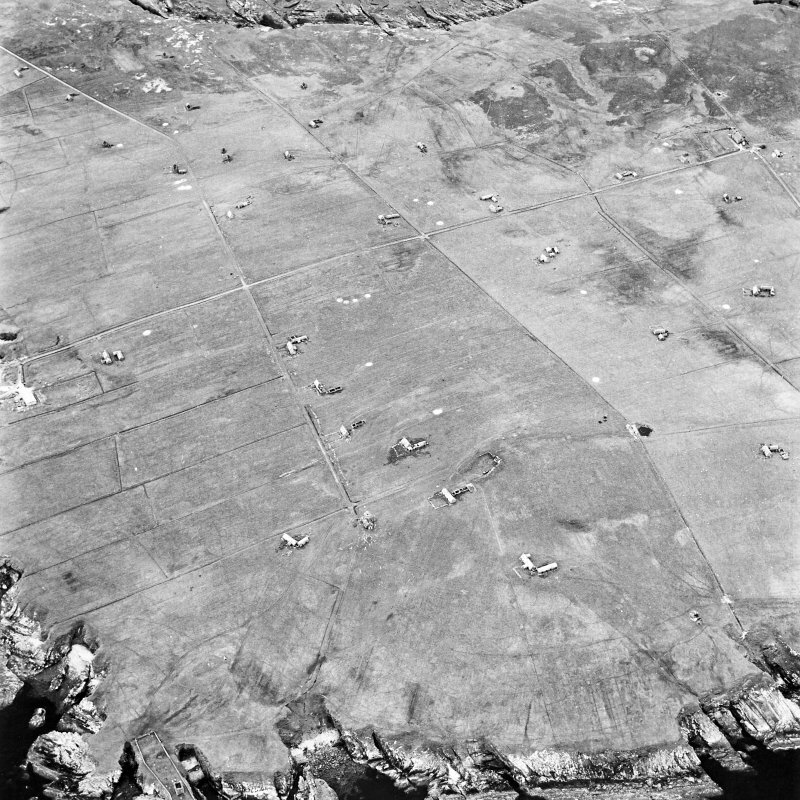 Oblique aerial view centred on the remains of the castle, burial vault and dovecot on Stroma, taken from the S.
Burial Vault and Dovecot: From the centre of the grave- yard rises a rectangular structure, now roofless, built with grey flags and pink sandstone quoins. It has been finished with an ordinary span roof, now gone. The building measures 25ft by 18ft 5ins externally, is formed of two storeys, and is some 22ft in height. On the ground level is a low vaulted burial vault. On the floor above the vault is a pigeon house. A stone at the S side of the W front of the building bears the date 1677 cut in relief. The brial vault and dovecot are as described by the RCAHMS and lie at the E end of the graveyard, which has been extened westwards. The burial vault and dovecot are as described and illustrated. There is now no trace of burials in the vault. Visited by OS (J B) 20 July 1982.